Everything went to hell after the fall of the Roman empire — at least in the western part. Literacy collapsed; roads were no longer maintained; interregional trade pretty much died out; barbarian marauders from the north preyed on the weak and innocent; steppe nomads from the east raped and pillages; perfectly arable land went fallow for centuries; and there was depopulation of much of what had been Roman civilisation in the West. Because of all that people generally assume “Dark Age” incomes were abysmally low. I think that bias gets reflected in the sort of highly conjectural income data we see for the period prior to 1200. But surely the Dark Ages were utterly Malthusian. In that case, with a substantial depopulation of the western Roman empire, enormous swaths of land must have been re-“frontierised” and “re-virginised”. That would have been a tremendous boon, i.e., more land per surviving inhabitant. Thus even in post-Roman Dark Age semi-tribal England with Aedelbehrts and Engelwulfs and Sigheoiscs pretending to be kings, perhaps it was possible to fill your belly everyday without too many worries. Perhaps you didn’t have many other amenities of civilisation, like entertaining theatres and exotic fruits, but you did eat more. We know from the settlement history of the Americas and Australia that they quickly became some of the richest places on earth, on a per capita basis. In Argentina, for example, there was so much more land, in relation to people, that at first it made sense to let cattle roam the place rather than intensively cultivate it (which requires a lot of workers). 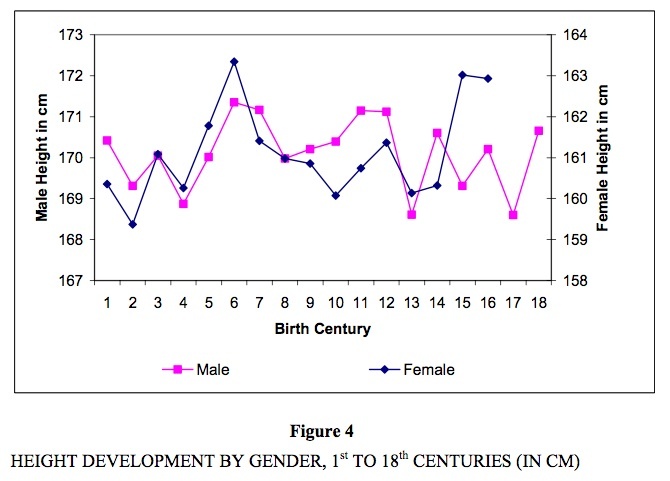 But there must be some evidence about living standards in the “Dark Ages” (from 400 to ~1000). And there is — the heights of people inferred from skeletal remains. The above data are separated by regions so populations with different genetic potentials for height aren’t totally mixed up. We see heights in the west rising with the decline of the Roman empire, and falling with the limited state reconsolidation under the Carolingians. (Not saying this pattern necessarily implies causation.) The High Middle Ages show a sizeable jump in heights (survivors better fed after the Black Death?) but after the peak circa 1400 show a commensurate decline. Overall I don’t see much reason to believe, at least in terms of a narrowly biological standard of living judged from stature, that the “Dark Ages” were worse than the subsequent 1000 years. Worse in welfare terms, perhaps, because civilisation should offer more than just bread, but in terms of offering the nutrition for stature, not worse. 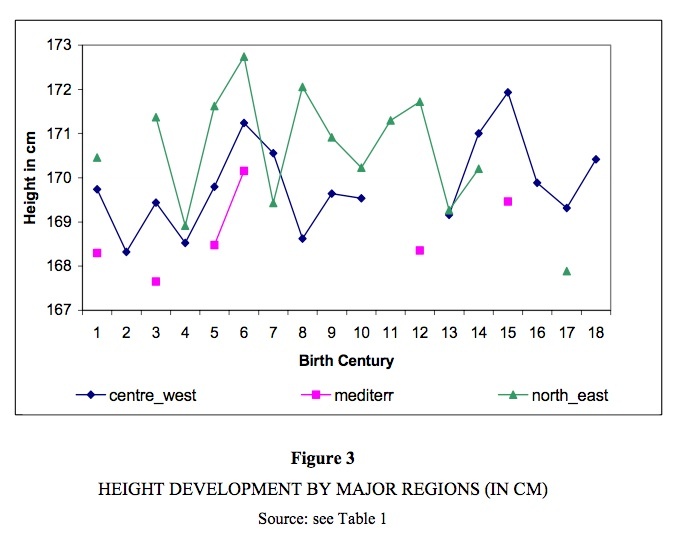 This paper offers the first anthropometric estimates on the biological standard of living in central Europe in the first millennium, and expands the literature on the second millenium. The overall picture is one of stagnant heights. There was not much progress in European nutritional status, not even between 1000 and 1800, when recent GDP per capita estimates arrive at growing figures. We find that heights stagnated during the Roman imperial period in Central, Western and Southern Europe. 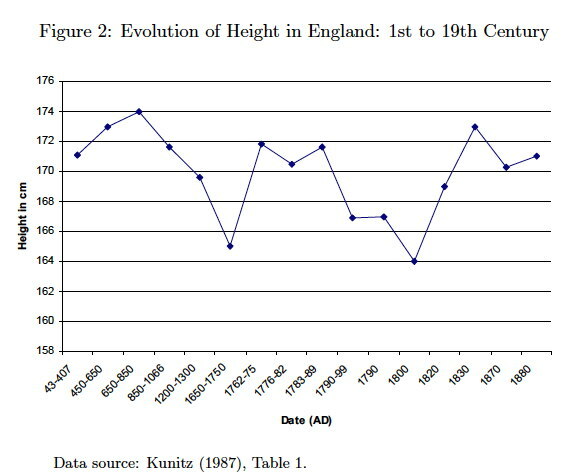 One astonishing result is the height increase in the fifth and sixth centuries. Noteworthy is the synchronicity of the height development in three large regions of Europe. In a regression analysis of height determinants, population density was clearly economically (but not statistically) significant. Decreasing marginal product theories and Malthusian thought cannot be denied for the pre-1800 period. Of marginal significance were climate (warmer temperatures were good for nutritional status), social inequality and gender inequality (both reduce average height). This entry was posted in Sociometrics and tagged Angus Maddison, Dark Ages, height, Malthusianism. Bookmark the permalink. I gather that British archaeology also points that way: that the former Romano-British lived a pretty depleted life. Ward-Perkins was briefly alluded to in the comments section of The Little Divergence blogpost. Does it really matter that cow size was getting smaller ? W-P doesn’t address human stature. W-P also just waves away the question of the income-bias of material finds about the Roman empire.